For our Hep C Support Group last Friday, June 26, we had Clinical Psychologist, Bill Coleman PhD, come and facilitate our meeting. Dr. Coleman has been a counselor for 25 years and has been working extensively in a sexually transmitted clinic for over 10 years. His experience with individuals dealing with sexuality, addiction, and incarceration issues has made him a very valuable partner of VIDC. Every couple of months, Dr. Coleman would come facilitate one of our Hep C Support Group meetings and have a little bit of a group counseling session with us. Last week the topic was values, or inner spirit as some might call it; or basically, who we are independent of our actions — because sometimes our actions are caused by our circumstances not really by who we truly are inside. Dr. Coleman broke down what our values are comprised of into three main components: how we see ourselves, how we see others, and how we see the world. It was a very informative and interactive meeting where attendees were able to express their thoughts and feelings about who they think they are. To close the session, Dr. Coleman directed us to the Barrett Values Centre website where we could get a free personal values assessment. Some of us had our results printed and we were able to sit down and discuss with Dr. Coleman, over lunch, what the results meant and how we should use this information. Defining who we are is a struggle everyone has to deal with, a struggle that becomes harder to overcome when disease/illness and life circumstances get in the way. Our goal last week was to remind everyone that our situations do not define who we are. As part of our commitment to holistic care, this was a necessary session to encourage our patients to not let the disease and the illness take over their lives. We love having Dr. Coleman over not just for his insights, but also because he is a health care professional that is very dedicated to his clients. His office is less than a minute’s walk away from our clinic, and he provides affordable counseling for those who need it. Find out more about him and his practice on his website. After ignoring Eric Cassell’s lack of gender sensitivity in his language (we’ll let it slide as it was written in the 1970s), his statement actually resonates very well with the VIDC mission. Our holistic approach to healthcare understands this difference and, as such, addresses both the illness and the disease. Initiatives like our DTES Pop-Up Clinics and VIDC Connect stem from this and seek to engage the community through awareness building and information dissemination. And we don’t stop there! 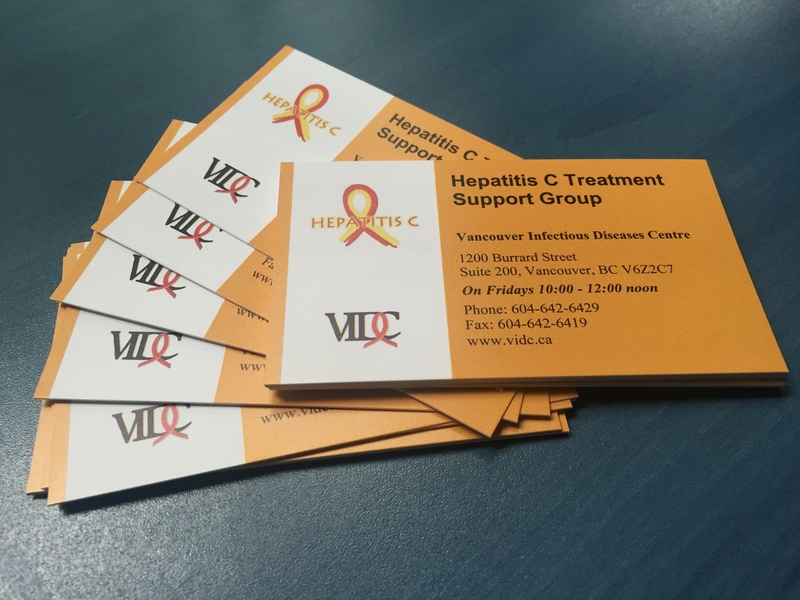 We directly engage with our patients through our Hepatitis C (HCV) Support Group. Every Friday from 10AM to 12PM we have breakfast, a discussion group, and lunch for patients who deal or have dealt with Hepatitis C (HCV). Our discussions are led by our HCV Nurse, Shawn, who prepares a presentation on anything and everything that’s related to dealing with Hep C — healthy living, coping with the illness, GMOs, new treatments, drug interactions, etc. Yes, we made it easy to invite people who would benefit from the group — we have our own business cards! It’s a discussion group meant to inform, educate, and provide social support for patients dealing with the illness and disease brought about by the Hep C Virus. Sometimes attendees just sit and listen to Shawn, sometimes they have very lively discussions on how they feel about healthy food options, and other times they have very heartfelt discussions on what it feels like to live with Hep C. Whatever the case is, it’s always a space where people can feel safe, cared for, and listened to. Following Eric Cassell’s quote, there is a huge difference between the illness and the disease caused by HCV. The medication can only deal with the disease, and that’s why we have the Hep C Support Group to help patients tackle the illness.